On Saturday June 4, 2011, after decades of inactivity, Puyehue volcano ejected a plume of ashes 10 kilometers high and five kilometers wide. This led to a natural disaster with strong environmental and financial impacts in the region. At the same time, the ashes that are now killing thousands of living beings, ensure the fertility of the region for years to come. The same ashes are the raw material of this work. “Efecto Mariposa” (butterfly effect) is an interactive installation that provides the opportunity to explore destruction and creation, which are combined in an infinite fractal dance, demonstrating the ability of life to cut through the face of adversity. 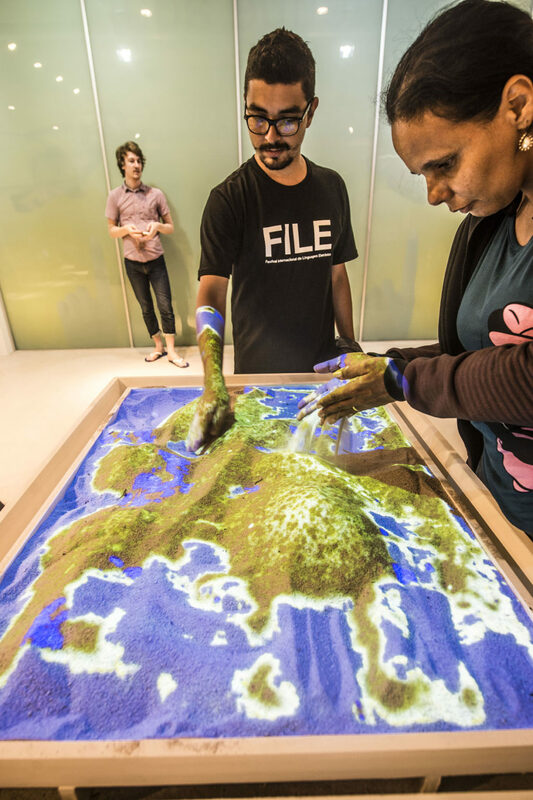 This is done by simulating an ecosystem on the surface of a set of real-time volcanic ashes. The interactor can modify with his own hands the “topology” and the “atmosphere” of this virtual world, unleashing all sorts of climatic and topographic changes that directly influence the conditions of life. The proposal is to alternate the perception among the micro and the macro to discover the complexity and richness of the world around us, as well as to realize our participation and responsibility in this whole. Patricio Gonzalez Vivo is a clinical psychologist specialized in expressive arts therapy and interactive projects focused on bringing cutting edge technologies to spaces where creativity and playing can bring transformation to people. Working in the intersection of Human Science, Arts, and Technology gave him the chance to be part of important projects, events (DigitalCamp Rosario & Santa Fe, Tecnópolis), MediaLabs (Interctivos at EFT Telefónica and CCEBA MediaLab), art therapy workshops (some of them for children with mental disabilty) and universities (professor at USAL, UP, and IUNA). From this process he has learned how to get to solutions thinking out of the box and how to concrete any idea through team working. From a technical point of view, he is very experienced in low and hight level languajes like C, C++, Java, and AS3, and in lots of artistic-oriented frameworks such as GLSL Shaders, Cinder, openFrameworks, Processing, and Arduino, what led him to manage several libraries related to natural interfaces (OpenGL, OpenCV, openNI, Box2D, AssImp, among others). His deep knowledge of Unix based OS (Linux, MacOS and iOS) allows him to design solid custom software.